Today, Google and Samsung officially launch the second-generation Chromebook, starting with the Series 5 550, which like its predecessor comes in WiFi-only and 3G combo models. I had the pleasure of using the new Chromebook for the past week as my only PC. The overall user experience is surprisingly satisfying and refreshing. In a computer market dominated by Mac and Windows, Chromebook is freedom from duopolies that define the experience within walled gardens and around desktop applications. But changes introduced with Chrome OS 19 make the user experience much more desktop-like, as Google cedes some of the browser motif for familiarity and usability, with multitasking being high among the reasons. If you read no further, the answer to your question is this: Yes, you can use Chromebook Series 5 550 as your primary, and only, PC. Google has succeeded offering online and offline capabilities balanced to most computing needs, while keeping cloud benefits primary but seamlessly integrated. For two months last summer, I used the original Samsung Series 5 Chromebook as my primary PC, in the first weeks and as my only one later on. I'll repeat the experiment at least through the end of June, and I might not go back -- strange, considering new OS X and Windows versions debut within months. That commitment says much about my positive first impressions. By the specs, Samsung's second-generation Chromebook is hugely underpowered: 1.3GHz Intel Celeron 867 processor (dual-core); 12.1-inch matte display (1280 x 800 resolution; 300 nit); 16GB solid-state drive; Intel HD graphics; 4GB SDRAM; webcam; two USB ports; DisplayPort; WiFi N; 3G (one some models); Gigabit Ethernet; 4-in-1 media card slot; and Chrome OS. The operating system stack supports Bluetooth, which therefore can be added by dongle. The WiFi model sells for $449, a $20 increase over the original Series 5 and the 3G 550 is $549 -- or 50 bucks more. Price increase surprises, particularly considering what's inside. Performance and price are so important, I pulled them out of this review into a separate, 1,500-word exploration. Quickly stated: Performance is there, but $549 is a bit rich. If you want more than that, please read the companion post. Before continuing, trackpad is priority mention. Users of the Cr-48 test model and commercially available Acer and Samsung Chromebooks complained about the trackpad, with good reason. Expect better now. Google rewrote the driver, and the 550 trackpad works! That said, no computer should ship with trackpad performance as bad as Google and its partners delivered last year. Out of the box. 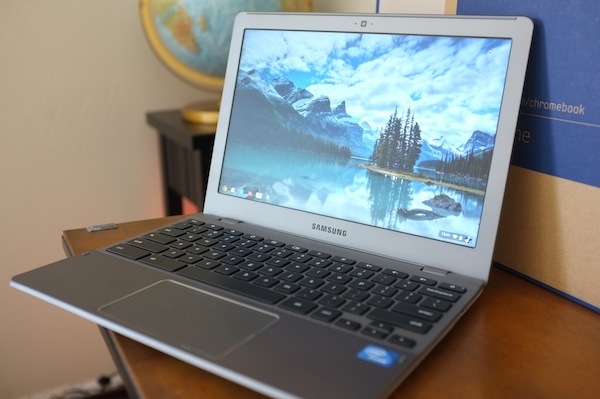 In January, based on specs and photos my colleague Tim Conneally collected during Consumer Electronics Show 2012, I called the new Samsung Chromebook a "cheap, plastic MacBook". Well, it's not all plastic. The rest bar is metal, and it's quite comfortable. Overall, the 550 feels sturdier than the original Series 5, and it's surprisingly handsome -- not cheap, or imitation after all. This has much to do with contours and curves. Setting up the Series 5 550 is similar to its predecessor. Open the lid, wait a few seconds for boot up and walk through language, keyboard layout and connection prompts to Google account login, and that's it. Setup complete. During my May 25 briefing with Googlers Linus Upson, vice president of engineering, and Caesar Sengupta, director of Chrome OS, I praised the trackpad performance but complained about the space bar, which consistently required multiple taps. Uh-oh, that can't be right, they said. Google sent a second 550, presuming the first was defective out of the box. So I had the pleasure of second setup. Changing computers was never easier -- just log in, baby. 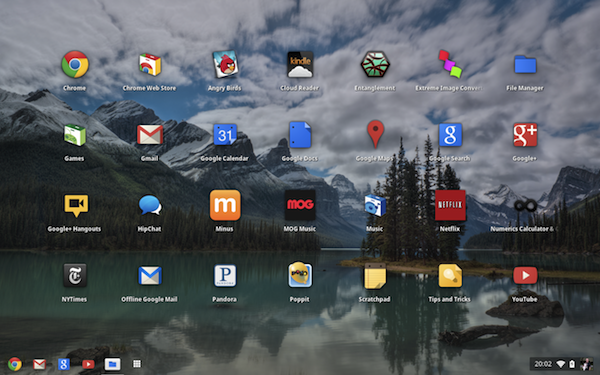 The point: Setup is one of Chromebook's primary benefits. The second Chromebook is better in other ways. The overall typing experience is smoother, and the spacebar works just fine. My typing speed is quite good, in fact. Keyboard comfort is hugely important in any laptop, and I worried about lag while typing. There is none. Closing the lid puts the laptop to sleep, while opening is instant-on. Seriously instantly. I used a Core i7 MacBook Air before the Series 5 550, and the Apple computer is nearly instant-on from sleep when connected to electricity, while taking 4-to-7 seconds to start when on battery. Samsung's Chromebook immediately starts whether connected to power or using battery. Truly instant-on is another Chromebook primary benefit. The screen doesn't exactly wow me. At 300 nit, it's bright enough, but text is typical, meaning just okay, for a 1280 x 800 display. Google can't magically improve viewable dots per inch without a hardware upgrade, but an optimized, customized font could go far to improve the visual experience. I compare to my Galaxy Nexus, where text is crisp, by comparison. Microsoft did wonders with ClearType. Google should do something similar. Still, the display offers one big benefit: matte versus glossy finish. Contrast isn't as sharp, but there's no glare, making the new Samsung Chromebook a much better outdoor companion than most other laptops sold today. Chrome OS. While hardware modestly improves over original Series 5, the software dramatically changes. Google introduced new window manager Aura with Chrome OS 19. While the browser motif dominates the desktop, it's not the only landscape. There is a bottom toolbar that is something of a cross between those available on OS X and Windows 7, plus there's a desktop now. OS X and Windows fans looking for a reason to diss Chrome OS should enjoy changes easily characterized as a big fail for the browser OS concept. The changes aren't so much concession as extension. The full-screen browser remains, but simply as option. Users can have it both ways, while gaining something else: Better multitasking, a capability the tabbed motif limited. Separate windows allow users to work more freely. In theory. I find the desktop motif to be superfluous. Tabs work just fine for me. Something else: there's an app launcher, which presents applications in grid-like fashion, reminiscent of Android. The launcher is unexpected, since these are web apps after all. But the motif works and makes the experience more familiar to everyone that has used popular mobile or PC operating systems. In the lower right-hand corner is a clock behind which there are some pop-up settings presented, and they take visual cues from Android 4.x. Actually, many of the UI changes subtly remind of Ice Cream Sandwich. Perhaps there is yet a future where Google combines Android and Chrome OS, something I would recommend. BTW, translucency is a design element, another similarity to Android. But Google adds translucency as Apple and Microsoft largely or completely abandon it in their operating systems. I'm a big fan of the motif. Chrome 19 is the stable build, as I write, but v20 offers additional benefits, with Google Drive integration being biggest. Chrome OS development closely follows the browser, which revs a new version about every six weeks. So Google will improve the Chromebook experience fairly frequently, within every few months compared to several years for OS X or Windows. The point: Chromebook improves with age, which is another benefit. Down to work. Chromebook critics often point to the cloud as foible -- that the computer is a brick without Internet connection. That hasn't been true for sometime. Chrome OS supports offline apps, even games, and Google consistently extends such capabilities. The search and information giant has done well making the online-offline experience/capabilities transparent. There are more offline, desktop PC capabilities -- albeit many still limited. The file manager is one, while photo viewer, with barebones editing capabilities, is another. There's an audio player, too, basic as it may be. I keep my permanent music library (about 13,000 songs) on an external, FAT32-formatted 1TB drive. Plugged into the 550's USB port, the drive is fully accessible, and I can play music using the audio player, which produces rich tones. Streaming is my preferred option, using Google Music. However, while audio fidelity satisfies, volume doesn't. When using Bose Companion 5 speakers or Grado Reference Series RS1i headphones, I need to crank up the volume near full on the Series 5 550, whereas I rarely pass one-quarter volume on the MacBook Air. Perhaps a better software driver will fix that. Something else: On both new Chromebooks, connected speakers blast feedback/loud buzz when the computer sleeps. The noise scares the crap out of the cat, if he's napping. The audio problems are simply unacceptable for a computer selling for more than $500. Google Docs and Gmail are available online or offline. There's little new to discuss here, other than I had no real problems working either way. However, most of my writing is done in HTML in a browser, so my testing Google offline apps is limited. As a cloud computer, Series 5 550 Chromebook is meant to be mostly connected. WiFi performance is excellent, with better range than the MacBook Air. The 3G model has excellent coverage, from Verizon, which offers 100MB per month free data for two years. Google and Samsung could have really set Chromebook apart from OS X or Windows laptops by offering LTE, which would better justify the $549 price. Verizon activation is supposed to be pretty fast, and was on the original Series 5, but I couldn't get it to work at all yesterday; five fails. Streaming video delivers handsomely, which hugely improves over the original Series 5 out of the box. However, the volume problem is pronounced on some sites, with Hulu being a big, glaring example. Google really must fix this. I've only done modest battery testing, but got more than 6 hours with heavy usage -- as in more than a dozen tabs open and music streaming. I expect consistent battery life to be close to 7 hours, which is a good hour less than what the original Series 5 Chromebook delivered. Granted, there's more overhead with GUI changes and dual-core processor. That said, battery life is a big Chromebook benefit. On a good day, I only get four hours from MacBook Air. I considered Chromebook, given the more desktop-UI enhancements coming, but there's no new hardware out there. What about Android? My Galaxy Nexus is so fast and responsive, surely there's a case for trying out an Ice Cream Sandwich tablet as primary PC for a month. Apps are plentiful, which appeals over Chrome OS. Obviously, new iPad would be contender, too, and I seriously considered experimenting that way. But that kind of thing has been done and written about often enough. Besides, Android tablet promises more challenges and so something more interesting to write about. I purchased the ASUS Tranformer Pad 300 and keyboard for the purpose. Someone at Google must read my posts, because later that Sunday came the offer for Chromebook and Chromebox loaners and briefing, three days later as Google+ Hangout using the 550's webcam. The Samsung Series 3 Chromebox also launched today. I was enthused about getting the Chromebook but apprehensive. Android seems more viable a long-term investment, given its popularity, huge app ecosystem and better hardware. Those are major reasons why I prepared to go Android tablet for a month, or at least attempt to. I also snubbed nose the specs, particularly based on last year's Chromebook experience. So I was remarkably surprised how satisfying is overall performance and usability as primary PC replacement. That's not to say Chromebook is for everyone or even most anyone. Businesses or individuals dependent on Office or other desktop apps should look elsewhere, for example. But the second-generation is ready for public consumption, which is coming soon. Right now, laptops running Chrome OS are available only for online purchase. Next month, Chromebook arrives in Best Buy, so that people will be able to try and buy. Between time, I'll offer ongoing updates about my next and unexpected Chromebook adventure.